Sauerkraut was started using one napa or Chinese cabbage. The cabbage was slice into small pieces crosswise, mixed with brine in a bowl, stuffed into a liter jar with the core shaped to keep the contents under the brine.The salt added to the jar was 20 grams or a heaping tablespoonful of pickling salt. A bubbler was added to the jar to prevent the contents from contacting air. Th sauerkraut will be ready to eat in about three days but full benefits will not materialize until about 3 months have elapsed. This method encourages the production of probiotics (a microorganism introduced into the body for its beneficial qualities). 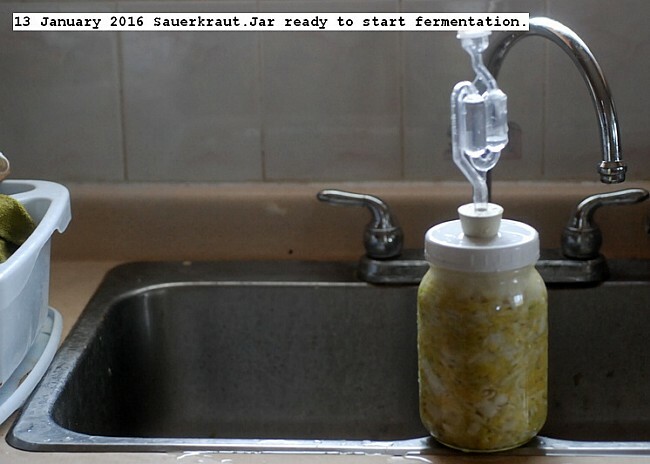 This entry was posted in Uncategorized and tagged Lacto-fermenting cabbage, Sauerkraut. Bookmark the permalink.